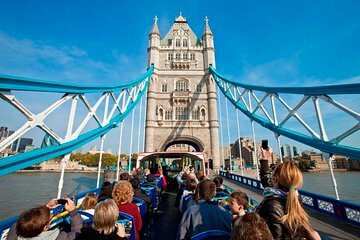 Enhance your experience of London’s iconic skyline with a hop-on hop-off bus and London Eye combo package, perfect for first-time visitors looking to shake up their sightseeing experiences. Plus, you’ll receive a pass for three free walking tours — including a Jack the Ripper tour — and Thames River sightseeing cruise. After ticking off top attractions such as the Houses of Parliament, Buckingham Palace, and the Tower of London, you’ll absorb sweeping city panoramas from a capsule on the London Eye. The Original Tour’s Yellow, Blue & Orange Routes offer recorded commentary, available in English, French, Spanish, European and Brazilian Portuguese, Italian, Russian, German, Japanese, Arabic and the exclusive Kids' Channel. The Yellow Route is the main tour route offering live-guided tours in English and well as multi-lingual recorded commentary. The hop on hop off bus is one of my favorites tours to do in any city. This one did not disappoint. There was so many round options in so many things to see. Hate that we didn't have more time to do all of them. The gentleman on the bus tour was outstanding!! He was very knowledgeable and incredibly witty. Far more enjoyable than pre taped audio. The staff at London Eye VIP desk amazing. We wanted to upgrade because the line was so long. The only challenge was that we could only do a tour within the hour because our flight was leaving that evening. They were kind and more than helpful on a very busy and chaotic day. If you buy a regular ticket be sure to go into the office to redeem your ticket before standing in the crazy line. Views were spectacular and I would highly recommend the VIP ticket. Hop on hop off London was amazing. We switched paper Viator for all tickets we needed. We like to take the whole route then decide what we want to get off and see. There are three routes that go to different areas. Our ticket included the Thames River 30 minutes, great sites of different views, London Eye which was a little confusing on where to hand in the ticket we were given for a time ticket but just ask. We also had three walking tours on the same Viator but ran out of time. I highly recommend this Viator attraction. We booked this thinking it's solve many admissions and travel problems. Tried to use cellphone barcodes three times to no avail. We were told we had to go to tour offices to validate and get another pass card. Unclear as to where those offices were. Weather to cold and rainy to have to walk to some distant office. We finally just gave up. My advice to anyone else would be to buy an Oyster card and use public transportation then stand in line to pay for admission to venue of choice. We stood in lines anyway only to be told our cellphone barcodes wouldn't work. Experience was great, However when going into the main ticket office to get tickets for London Eye we waited in line to be told that we had to go to another ticket office to redeem the ones already given to us. This was not passed into us only found out when we stood in the quene for the ride. After this we paid extra for fast track as we were not prepared to wait again. Other than that a good way on the bus to see all the sites of London and the stops were in a great location of the main attractions.